Map: Blood Harvest 3, The Bridge (l4d_farm03_bridge). S@W team: Chili, €nder, Ghost and Loffy. First play. It lasted 5 minutes and gave team S@W 55 points. Team S@W leaves the safe room and team 4What quickly attacks with boomer and hunters, but without doing too much damage. S@W moves forward to the first open area and onwards. A combined hunter, smoker and boomer attack stops S@W here. S@W tries to advance but they have only half their health. And no Molotov. Suddenly, Mr Tank arrives, and smacks S@W around. At the end, there is a hunter and a smoker that helps the tank destroy the S@W team. Second play. It lasted 8 minutes and gave team 4What 175 points. S@W is gambling that 4What will open door and go right. Three S@W members are positioned there, including the boomer, to meet team 4What. However, 4What turns left and run like hell, which surprised S@W. Anyhow, the S@W team managed to get in a boomer and hunter attack to take some health away from 4What. As the 4What team goes out into the open, the S@W guys manage to do a hunter plus boomer attack and create some panic, but not too much. 4What throws a pipe, so the situation is no problem for them. A little further on, Mr Tank arrives. 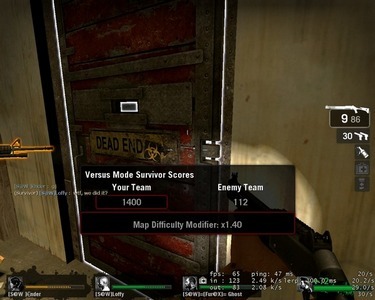 4What have Molotovs, and they put it to good use. By running backwards, they make the tank suffer and soon they can see him go down in flames. After healing up, 4What moves towards the sleeping bags. They do not get attacked during this time, which was bad from team S@W’s point of view. S@W should have attacked here. Then 4What moves into the building, towards the train tunnel. They have a solid team play at this stage and S@W cannot hurt them so much. 4What then moves out into the train tunnel, towards the hangar on the right side by the train wagons (inside the hangar there is ammo and a Molotov for them). Just as they leave the hangar, they get hit by a nice boomer, smoker and hunter attack, which stops them totally. Francis and Louis goes down and are really hurt. When they are revived, a second attack by the S@W team puts all four down on the ground. Third play. It lasted 10 minutes and gave team 4What 112 points. S@W is now counting on 4What to open door and go left, like they did a couple of minutes ago. 4What, however, does not go left this time. They go right and towards the first room on the right side (with the generators). S@W is surprised by this, and does not manage to produce a strong first attack. 4What can clear the corridors and move ahead with ease. However, 4What moves rather slowly and the boomer can do one more attack before they leave the corridors to go outside. There is no follow up by hunter, so the boomer attack is no problem for 4What. As 4What goes out into the open area, some serious attacks are made and they lose a lot of their health. The next two boomer attack are not successful (but there are some nice hunter pounces) and this makes it easy for team 4What to advance forward. 4What goes for the sleeping bags again, to check for stuff. There are just some pills there. The 4What team moves into the building, towards the train tunnel and, yet again, they show a solid team play here. However, they are more hurt now, compared to the previous play. They are also attacked repeatedly here, by boomer and hunters. As they reach the hangar (out, by the rail and the wagons), they are attacked hard by the S@W team. They also get a little bit separated from each other at this point. Inside the hangar there are pipes and ammo. As 4What leaves the hangar and moves forward, towards the house with the health packs, the S@W attacks. The attack is well synced, with boomer, two hunters and smoker. 4What survives, but the next attack (on the same spot) brings half of the 4What team down. Suddenly, at this point, Zoey (player Ozoro) manages to get away and runs for the wagon and sets it in motion. 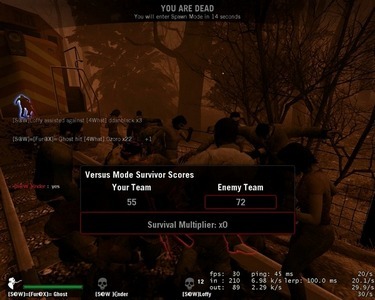 Incredible enough, Zoey then runs slalom between the oncoming infected and one hunter, and makes it all the way back to the house with the health packs, near the final bridge to safety. That was the luckiest solo run in the entire match. However, the 4What team is really separated and some of the players are down on the ground. The play ends here, when all four 4What goes down, inside or near the house. Fourth play. It lasted 9 minutes and gave team S@W 1400 points. S@W needs to perform really good now, to win this match. They leave the safe room and turn left, where a boomer awaits and explodes in their face. The attacking zombies are no problem for S@W. There is no second attack while in the corridors, and the S@W guys can move on, towards the open area outside. It takes a rather long time before they move out into the open, but eventually they go out, only to meet a strong smoker, boomer and hunter attack. S@W fights off the oncoming zombies and advances into the house, without going via the sleeping bags. High on pills and loaded with Molotovs, they move forward through the corridors. After a short time, they move outside into the railroad tunnel. By using pipes, to fight the zombies, and by running like mad, they reach the hangar on the right side, at the wagons. There are some strong attacks in the hangar, but the S@W team manages to fight it off. Armed with only a Molotov and a pipe, they leave the hangar and move towards the house with the health packs. They only make it 30 meters before there is a really strong boomer, smoker and hunter attack that almost stops them completely. After that attack, they are down to 75% health. Suddenly, there is another strong boomer and hunter attack. At this point, the S@W is struggling hard to stay on their feet, but they manage to throw the pipe and the Molotov and survives. Once team S@W gets inside the house, they use the health packs, load up some ammo and moves straight towards the wagon. They start the wagon rolling (which alarms the zombies) and run back towards the wooden bridge. Initially, there are only a few zombies that are alarmed. The first three team members reach the bridge quickly. Hunters plus zombies stop the fourth member, who is just 15 meters behind the other three. At this time, the 4What smoker grabs one of those three members who is on the wooden bridge. Here, for a short period of time, only two S@W members are standing and are able to fire their weapons. For 5 seconds there is a panic, but (thanks to the fact that all four team members are within close reach of each other) they are able to free themselves. After taking their pills, all four members of team S@W move upwards, towards the safe house, where there is a final boomer and hunter attack just as they close the door.